W. S. Merwin’s The Mays of Ventadorn beautifully combines literary autobiography with literary history: What is in fact personal for Merwin is presented as distant or impersonal, while various histories come alive through Merwin’s unique powers of attention and his lovely translations of poems by different troubadours. Each paragraph of the book reads a little bit like a poem. And each poem translated in the book contains a hundred stories. If you enjoy Merwin’s lucid and impersonal writing style, his quiet, compact, and inimitable observations that go to the heart of our natural world, then you’ll love the experiences he unfolds in these pages. For Merwin, lines such as these seemed like “an invitation.” Though he read their work mainly in translation, Merwin accepted this “invitation” of the troubadours, and as a young poet, he journeyed first to visit with Ezra Pound in St. Elizabeth’s psychiatric hospital. After Merwin left, the two men continued a friendly correspondence. In particular, Pound’s note to “read seeds not twigs” resonated with Merwin. And so Merwin journeyed overseas to discover the seeds of the poems he loved, through the layered landscapes of France, to discover those “silent walls where the songs began”. “It was a continuing treasure hunt,” Mewrin says of finding “the manoirs of all sizes, some of them reduced to being used as barns, with their towers crumbling and portals cemented over . . . trying to learn something of their current status, imaging life in them at one stage or another of their past.” This is a distance “both in geography and in time, a secrecy of its own,” he notes. 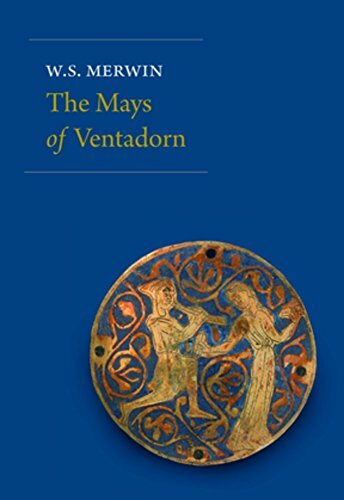 In various places throughout the book, Merwin elaborates on the multiple meanings of the word may: “In the Occitan region the arrival of the month of May as the returning season of love had been celebrated with festivals since long before Christianity. The rites of spring were remnants of fertility ceremonies practice in the time of the Roman occupation and among the Celtic peoples long before that.” And in the first known love poems of the troubadours, we often find the hawthorn, also known as the mayflower: “The way this love of ours goes on / is like the branch of the hawthorn / that keeps trembling upon the tree . . .” The tree was named “may” because of when it bloomed: the spring, more specifically, during the month of May. About halfway through the book, the reader finds the various denotations of the word “may” begin to cohere into a larger theme: May, the month. May, the month, patterned over the years, not just a single month in a single year, but the many months of May telescoping through the centuries. And the may (tree) or mayflower at the center of troubadour love poems, written over the many months of May, generations all cycling into bloom in the same region of France, centuries ago as well as today. The same region of France Merwin visits in the 20th century is viewed through a period of modernization and industrialization as he travels back and forth, staying and leaving at different intervals. It’s as if each page in this compact book were some kind of translucent map drawn over time that provides inscrutable details about the nature of life, each detail overlaying the next, adding to the richness—and to the perceived distance or closeness—of our different experiences. Of course Merwin’s small book is far from being a complete literary autobiography; nor is it a complete literary history of the troubadours, though it incorporates quite a bit of historic and scholarly material. At the same time, this book does not pretend to be complete nor scholarly. Rather, it is a personal take, one poet’s slice through time, revealing a cross-section of where the “heart has gone,” and where it continues to go today.